The death of Elizabeth Benjamin’s mother brings her back to Key West, the home Elizabeth loves, the home she hasn’t seen in four years. Her homecoming, however, is not what she hoped. Her brother resents her, the servants do not obey her, and Rourke O’Malley, the wrecker she vowed to forget, refuses to let go of her heart. When it seems matters cannot become more difficult she discovers her father is not the man he appears to be. 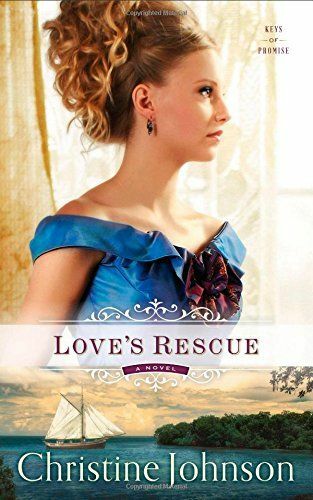 As family secrets come to light, Elizabeth must make a difficult choice- perform her duty and abandon her dream of the sea or leave her life of privilege behind for a man her father sees as little better than a pirate. This story is a fifty-fifty for me. I didn’t hate it and I didn’t love it. I’m not quite sure where I would put it on the bar. I kept reading because I was curious about the father’s secrets, although I had my suspicions. Elizabeth’s and Rourke’s relationship was a hard one for them. They live in a time, 1850, when the parents, mainly the father, chooses the husband for a daughter. Elizabeth was in a sticky mess for sure. The characters were easy to follow and the style of writing flowed well. It took me a while to get my “sea legs” and learn the ship terms. Even not I’m not sure what everything means. I suppose in a scale of 1-10 (1 being horrible, did not finish and 10 being best read, 5 being okay) I would give this book a 6. This is the first in the “Keys of Promise” series. Would I read the next one? Honestly, probably not.